When you arrive in Australia you will need to get used to the fact that the Southern Hemisphere’s weather patterns will be as ‘down under’ and upside down to you as everything else! If you jet off in November or December, you may struggle to get your mind around seeing Santa Claus hats, snowflake decorations and reindeer gimmicks in every second shop when the weather is close to 40 degrees outside and everybody is at the beach trying to cool down. 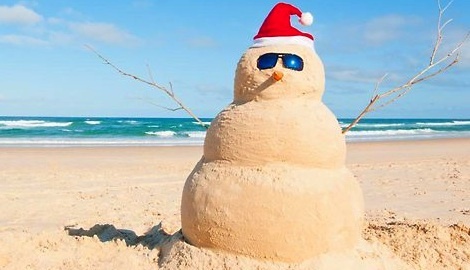 For the average Aussie, the thought of Christmas goes hand in hand with summer holidays full of long sweltering days. Most people relate Christmas to some of their happiest moments as a child, with memories of long sizzling days on the beach with their parents and siblings. For some up north, they hope for lots of tropical rain, lush green paddocks and over flowing creeks and dams. Summer means wet season and a chance for the land to replenish. The months of December and early January also fall over Australia’s school holidays so most people tend to celebrate Christmas and New Year with a family BBQ on the beach or a party around the pool. There is always lots of seafood and ice cream, and a couple of cartons of beer of course! Most Australians cannot imagine what it must be like to experience Christmas in winter, but often envisage a romanticized version with snow gently falling, families strolling through Christmas markets and couples enjoying mulled wine in front of an open fire nestled cosily in the corner of a traditional pub. As we all know, sometimes (especially the snow which can often be more like drizzling rain) this is not the case and many of us would be more than happy to swap this for the Aussie sunshine! Believe it or not, without Christmas to look forward to, the Aussie winter months (although fairly short-lived) can seem a little uneventful. The nights draw in early and once the sun drops it’s time to grab a blanket and some comfort food. Many Aussies, in particular those ex-northern hemisphere residents, thought something was needed to brighten up the winter months. This is where the concept of ‘Christmas in July’ comes in. It is usually celebrated on 25th July and is getting more and more popular as the years go by! The phrase originates from the 1940s film of the same name. Aussies celebrate with a traditional Christmas dinner, log fire (yes contrary to popular belief it does get cold enough in many locations! ), and gathering of family and friends to mark the occasion. 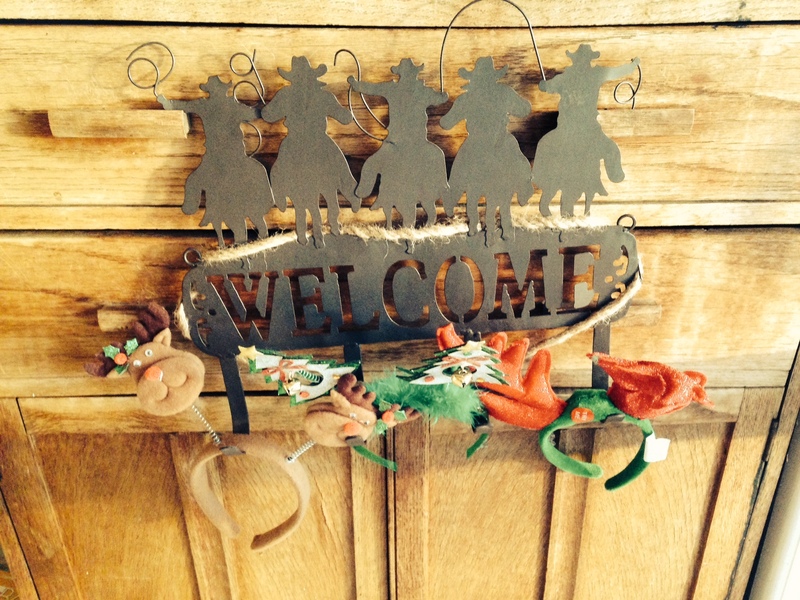 Houses and gardens are decorated with traditional and festive Christmas memorabilia for passersby to enjoy. Many chose to go the whole hog and take a trip to the Snow fields of Australia. Popular locations would be Thredbo, Perisher Blue, Mt. Buller, Mt Selwyn, Falls Creek – all with the possibility and hope of snow at this time of year. So make sure you grab yourself a pair of UGG boots and take a warm jumper so you can cosy up in front of the fire and join the party! Have a look at our website for further information on working in Australia. Take part in this programme if you are aged between 18-30 and from a reciprocal country that is eligible for a working visa. We offer a work and holiday package which involves a farm work training programme and then a guaranteed paid job working in rural Australia. You can also take part in a similar starter package from Sydney where you will be able to witness the other side of the coin; living as a local in the big city! This orientation week includes a trip to the famous Blue Mountains and an awesome 2 week surf camp weekend where you get to meet lots of other young people just like you. Enjoy a working holiday visa for up to a year. If you complete 88days (3months) farm work or fruit picking in an eligible, regional post code, you will also be eligible for a second working holiday visa. With Oyster you can also witness Australia at any time of the year through volunteering on our wonderful conservation programme. Choose to depart from one of 9 gateway cities around the country. You could be departing from cosmopolitan Melbourne, world famous Sydney, sunny Perth or tropical Darwin. Projects are outback, rural of suburban. What a great way to get off the beaten track and meet some of the locals through community based projects. Don’t forget that New Zealand is also a place where summer means Christmas! You can take part in a work and travel programme and a conservation programme with Oyster! Next Post What is conservation volunteering in New Zealand like? Previous Post Plastic Free July and why this is so important!